We are a family owned pest control company located in St. George, Utah. 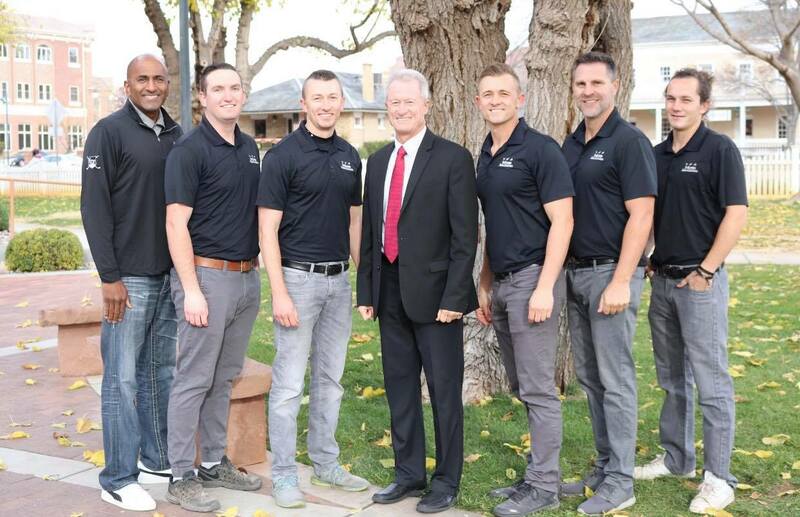 We have been in business since 2003 and have expanded to cover all of Washington County, Cedar City, Mesquite and Las Vegas. We offer superior pest control services at a reasonable price, without getting locked into expensive contracts. We know if we do a good job, every time, you will want us to come back! Poor housekeeping is just one way cockroaches become a problem. They breed quickly so act fast. There are plenty of ways for spiders to get in. They can be in search of heat, moisture, food or friends. A few entering because of poor sanitation and food scattered around the house can lead to infestation. Plants, garbage and other insects can draw wasps to your home. Clean up your messes, and cover the trash. Bees look for dark, safe areas to nest. If you have areas exposed to the outside, there is a risk of infestation. The path for termite infestations is typically from the yard to the foundation of the home. Bed bugs can be picked up anywhere, and get back home with you by hiding in personal belongings, like a purse. Because of their adaptability, rodents can be difficult to exterminate. They also reproduce quickly. By finding gaps or holes in your structure, bats can get in and use your attic or another place for roosting. How often should we spray our home? Be preventative in keeping pests from getting into your home! A monthly or every other month program is best, if you want to keep from having issues and have free callbacks. We are happy to accommodate anyone’s needs and desires for their pest control service. Are the products we use safe? We do a lot of research to make sure we are using products that are safe to be used around homes and labeled that way. We also use products that are labeled with a “Caution” warning rather than a “Danger” warning. We make sure that any products we use are labeled for the situation they are being used in. We also make sure our products are safe to be used around pets and kids. And of course, we always recommend letting the product dry before touching. Do the sprays and products at Home Depot work? Unless enough is bought and applied correctly for the right situation and pests. The problem is the products are so diluted because normal consumers are not licensed to handle the products. Often, they are labeled incorrectly for the right situation and pests, as well. In short it will usually cost you more money buying these products versus getting a professional. Do we offer free callbacks or a guarantee? If you are on a consistent schedule of monthly, or every other month, we offer free callbacks in between services. If the you are on a quarterly schedule or less, we offer a 30 day callback guarantee. The reason we can’t guarantee any more time than that is because pests can build up quite a nest in between sprays in just 60 days. If it’s been too long, the product will weaken, letting pests get into areas they normally wouldn’t have. This makes it hard to guarantee, and sometimes get rid of, all the issue if not sprayed consistently. What are the pests we have issues with most in Southern Utah? Will I be in a contract? We strive to provide a service that takes care of your pests efficiently, which in turn will keep you as our customer. However, we do offer special discounts for those on the schedule system, who are having their homes treated on a regular basis. What can i do to help keep my home pest free? The most important part is cleanliness. If inside the home is clean then you can significantly reduce chances of infestation of any sort. This also includes the outside. Making sure there isn’t debris stored against your home or close to it. Bugs want places of cover, and if we provide that cover then they’ll happily move on in! In addition, always be careful with pet food storage, and clean up spills and animal waste immediately. Maintaining these few items will drastically help with preventing bug problems. I’m not seeing any bugs do I still need to spray? Pests are always around the exterior of our homes. The best way to make sure it stays that way, and not on the inside, is to spray consistently to prevent them from getting into the walls or finding access areas to create nests. It’s important to treat the home regularly so that the product doesn’t get too weak, allowing the pests a way to find areas to nest around the home or in wall voids, etc. That is why we think it’s best to be on a schedule and have your house sprayed at a minimum every 90 days but recommend every 30 to 60 days. Is it necessary to spray through the winter? A lot of people think that because they’re not seeing the bugs, that means they’re not around. But really, they are actually hiding in warmer areas where they are protected from the cold. Sometimes during cold snaps or rainy weather it pushes these pests out, which is why it’s best to stay on top of it so you don’t have an issue arise if the product has worn off since your last treatment. We get a lot of calls on scorpions and ants in the winter time trying to get away from the cold temperatures. If it rains after we spray or the sprinklers go on, does it wash the product away? No. As long as our product has at least 30 minutes to dry, it is made to deal with the elements. We use a Micro-encapsulated product that is made to last up to 90 days through rain or sprinklers. Tell us about your pest problem, or any specific questions you have.